The McCall Archive Collection has released two wonderful 1930s designs – a gorgeous gown worthy of Jean Harlow, and a lovely day dress. Just look at this pattern with its cutouts, hip yoke, and bodice overlay! Beautiful, complicated construction - this lovely lady has some depth of character! Both of these dresses have some pretty fabulous style lines. I love a 1950s frock, but at a certain point, I need a palate cleanser. And I believe these fit the bill! My only real complaint is that there is not a fabulous sleeve included with one of the designs. There are so many arm covering variations during this period that I would love to try. Who else wants one of these sleeve patterns reproduced? Or how about a hat pattern (although they must not be very popular since they go out of print rather quickly)? Maybe next season . 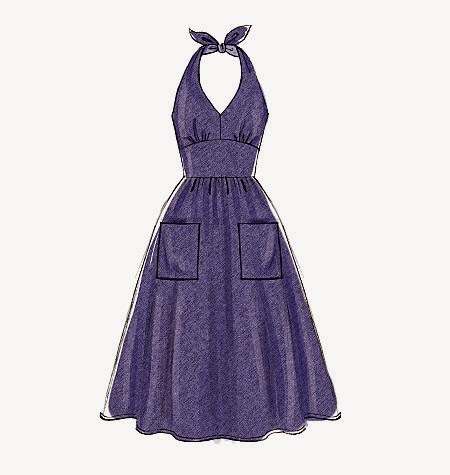 . .
And should I feel the need for something with a 1950s flair, there are always options. This top, for instance, looks very Audrey Hepburn in Sabrina to me. 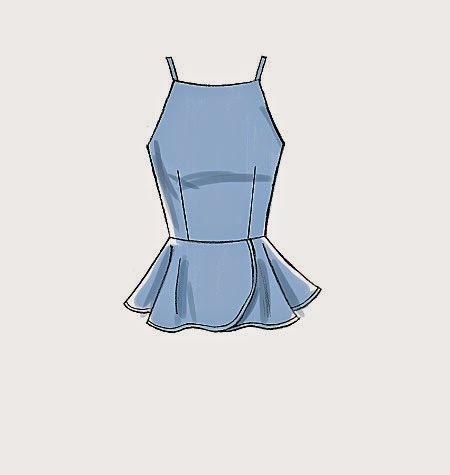 And I don’t think I will ever get tired of a classic halter, fitted waist dress, no matter how many options I already have in my pattern stash. But I love having some other new and exciting options to try! Who wants to play dress up in that gown!? I saw the Archive collection this morning and thought of you. And I love both designs, except little itty bitty details. For example, with the gown, why did they put that little bit of ruching at the hip? It looks like a mistake to me. If I were to make this gown, I would take the ruching out. (Seriously thinking about it, I have a similar pattern on my wishlist from decades of style.) I also think the curve in the kimono sleeve is a little off, so it poofs weirdly. But I love both designs, what if you took the second dress, took the kimono sleeve off and added a sleeve, maybe something like this? https://www.etsy.com/listing/214284695/1930s-vogue-vintage-sewing-pattern-b36?ref=market. In the picture with her hand on the hip you can see where the sleeve wants to be. I feel silly being so nit-picky about the patterns because I love the fact that they've done 1930s again. I think the hip gathers need to be more pronounced, or taken out completely. With the poly satin, it does look like a mistake, but it might work in another fabric. And I agree regarding the kimono sleeves - I think the fabric is the mistake there as well . . . the dress needs something with a bit more drape than the sample shown. These are lovely! That evening gown... I've seen so many drawings of 1930's designs with the top blousing over a more fitted skirt and the look seems great. I was just never sure about it because I had never seen an actual picture. On a real person. I love it even more seeing this dress. I should definitely try a style like that. You should absolutely try this style - I think you would like great in a 30s design! I love this gown - I would never have seen it without your post, so thank you! I love the 30s style, so it's great that they're reproducing styles from that decade and not just from the 50s and 60s. I agree about the ruching on the hip, it looks like it's a fitting issue! It is such a relief to see something other than the 50s and 60s (no matter how much I love those styles)! The first dress is stunning, but where can I go dress like that? Maybe to a Suppressed Desire Party! I'll keep it in my archives, something good will come for sure! I just saw the evening gown and my first reaction was, "I want that!!" Such a beautiful gown. Me too! Now we just need the proper events to attend! That top one, with some black velvet trimming, could look like a dress from Gosford Park. The second, I think looks like it is straight out of Agatha Christie. Wish I had the shape for them! The liquid satin is a hard look to pull off . . . I think a matte fabric would be equally beautiful, even in a print! That first dress really is stunning. I need it. The gown on top is a winner. If were 30 years younger I'd be running out to get it. Nice to see McCalls is traveling in the right direction. And I don't think this one has an age limit. I would never put my body in clingy white satin (even at 18 years of age) but another fabric choice would certainly work! That satin gown will be stunning to make--but wow, difficult to say the least. Like a few others have mentioned, I am also bothered by the slight gathers at zipper top and front hip--it's my guess they have pivoted more conventional hip darts around to the center seams then gathered out the fullness. Um, no that doesn't work for me, I would be pivoting that fullness right back up to the waistline dart position again for a smoother fit across the tummy, as if I will become young and slender in the hips again. Difficult is a good thing! Do it! I think this would be a fabulous choice for the event! Well, well well. I don't know how they have gone from zero to hero with this year's efforts, but I am so glad that they have. These will probably be the most exciting pattern releases of the whole year. The cut of the 30s day dress looks lovely. I have always been drawn to the illustrations on the old sleeves, collars and dickies patterns. Well done to you too I think they must be reading your blog and acting on the feedback, this is definite improvement. I just took a closer look at the day dress sleeves, they would probably look better in a soft fabric, this sample looks like it's made from cotton. I think you are right - the whole dress would look a lot better in a fabric that drapes beautifully. Alright Laura Mae, so you found the pattern for your next societal soiree. We both know you're going to sew it, in some scandalously spun silk from Italy via Britex, and under some 'doo involving Marceled hair (gently tossled, not rigid, please). True to form, you will create more work for neck and spine surgeons in one night than all the step ladders and skateboards combined. Shortly afterwards the California legislatures will put a long-overdue warning sticker on YOU! [in a stage whisper] At least that's what I've overheard! The second dress should have opted for a simple cap sleeve, or something more fluttery concluding on the side in line with the apex (too little fabric to get wonky, or so much fabric it is a design element). As for the first dress, a soft metallic (platinum, bronze, rose gold, warm brass) are worthy options. Be certain to avoid anything too close to your flesh hue (no matter how lovely the hand). Whether you start a trend, or a riot, for the sake of McCall's 7154, I'll do my best to hold my tongue. That dress definitely requires some special fabric . . .
Has anyone else noticed how many reto/repro/vintage dresses have come out lately that don't have sleeves? Or only sleeves that are a part of the top its self? I think pattern co. are afraid that women don't know how to set in a sleeve anymore so they don't print patterns with great sleeves. A lot of patterns for dresses are "dumbed down" recently don't you think? How have I not seen sleeve patterns before this? Brilliant!!! I think they are pretty rare - but such a wonderful idea . . . not sure why they went out of fashion. Come to think of it, why did interesting sleeves go out of fashion?! New Vintage Lady introduced me to sleeve patterns a couple years ago, but they are hard to come by generally. Hats are my bete noire, and I have resorted to keeping a list of the ones I HAVE so I will stop rebuying them in a panic when I see them. Hi, I love looking at your blog and seeing all the fabulous items that you make. I also sew and knit but have to ask you what do you do with all of the things that you make?. I tend to stick to making items that will receive a good amount of wear and fit into my daily wardrobe because for me when I have put in a lot of effort to make something I want to reap the rewards and enjoy the tailor made feel of the item made especially for me. An awful amount of the clothes that I see you make look like they need a special occasion to wear them to. Do they get much wear? Keep up the fabulous sewing and knitting and keep posting on your blog - I enjoy it very much. I am in love with both of these patterns. I can see myself wearing the dress, but the gown? Probably never. Both are above my current sewing ability, but both patterns will be mine! I love the sleeve patterns!